I can’t believe today is already the official Big Game day! All this anticipation has had me super excited for this day to be able to indulge is some tasty snacks, appetizers, and of course cheer on our New England team! 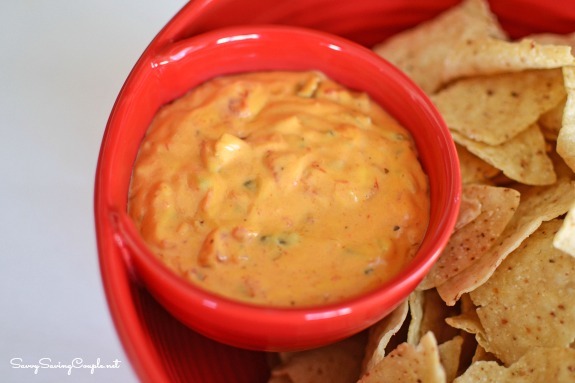 What better way than to make some tasty 5 minute, 3 Ingredient Queso Crock Pot Dip? Honestly, it is the simplest queso EVER and it is done in a jiff! This is the perfect last minute Big Game dip or appetizer! I am so excited to serve it to my family later in style thanks to the folks at LTD Commodities! Their entire line of football related appetizer dishes, and serving ware is allowing us to celebrate the Big Game in total style! Chicken Wing Serveware: How cute are these little football shaped bowls? I can honestly find 101 uses for them rather than just chicken wing dishes! 8 Piece Appetizer Serving Set: These are so elegant and perfect for cheese and crackers! I can see myself getting a ton of use out of these for my food photography too! Oversized Chip ‘n’ Dip Bowls-Red: This is one of the best chips and dip bowls around. I love that it is one solid piece which makes parties and entertaining so much easier! Chicken Wing Platter *NLA: This football stadium themed chicken wing platter is ideal for wings, dips, cookies, and more! The addition of the extra football shaped bowls was great! Each of the items we received was packaged so carefully and arrived rather quickly. I have been a customer of LTD for 12 years myself, but my mom has been a lifetime customer! I have always loved the detailed catalogs they’d send in the mail because everything always looked amazing! It was no surprise that the quality of these appetizer items was perfect! 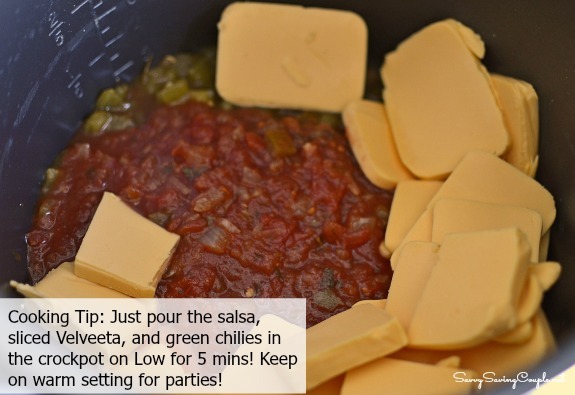 Now onto the 5 Minute, 3 Ingredient Queso Crock Pot Dip which we served in our LTD Oversized Chip ‘n’ Dip Bowl. Add each ingredient to the crockpot on low-takes 5 minute to melt/meld. Stir well, and then set your crockpot to “Warm”. Of course you could make this on the stove over medium heat and keep it on warm, but the crockpot makes things easier. If you are having guests over I suggest doubling or even tripling this recipe. This recipe is sooo darn good, and totally foolproof! I think it is the perfect last-minute appetizer for the Big Game. Love these items from LTD Commodities? I know we sure do! Be sure to connect with LTD on social media sites Facebook and Twitter. Previous Post: « 10 Minute Caramelized, Oven Roasted Brussel Sprouts-So Tasty and Delicious! I am all for anything I can make in my crock pot. That sounds so good! That looks delicious! I’m a big fan of anything with the word queso in it, and I love using my crock pot. I love to use my crock pot to make dips!! Its so quick and easy and they always turn out amazing!! Great dishes for a party! Yummy- I have all those ingredients in my home at this very moment! I am always looking for something simple to whip up when we have friends over to watch a game! Oh I need to make that with my crock pot. Perfect for get togethers! We made something similar last night for the superbowl! This sounds tasty, and I love that chip and dip bowl! Oh yum! There’s nothing better than a dip like this. Plus, 3 ingredients?! LOVE IT! This looks like a great dip! I will have to make it for my next party. Yum!! 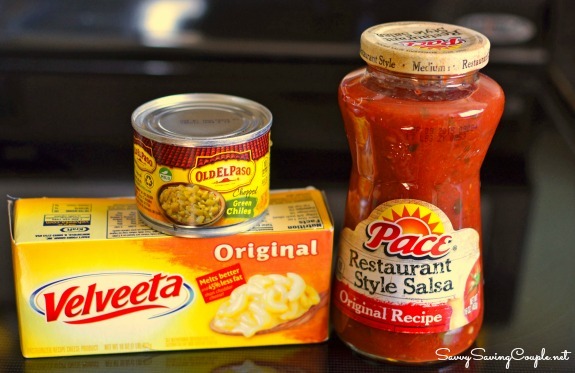 I’m a queso fanatic so I will definitely have to try this recipe – I’ve used Velveeta often but never thought to use the green chiles and Pace salsa! Sounds SO easy, too. This looks so good! I will be saving for next football season! My husband would be the happiest man alive if I made him that dip! I absolutely LOVE the football serving set!! I have been looking for a new dip recipe to try. This one looks so delicious and simple to make i will have to try it. Oh i am in such a mood for Queso right now! Velveeta makes the best queso dip! And I love the ease of the crock pot! Talk about the perfect party dip! This would have been perfect for Super Bowl Sunday! Both of my kids like queso dip. I’m sure this is so much yummier than the premade stuff! I have made this before but never added the chiles to them. I bet it gives a nice kick! I love anything queso. I have to make this because my kids love when they get to have dip. This looks so easy and yummy! Perfect for parties! I’ve done this dip a zillion times, never in a crock pot before. It’s also great if you brown up some burger or Italian sausage and throw it in there also. I would get the Set of 2 Insulated Suede Curtains in Chocolate or Sage. I have a room in need of new curtains that they’d look great in. Mmm, this looks yummy! 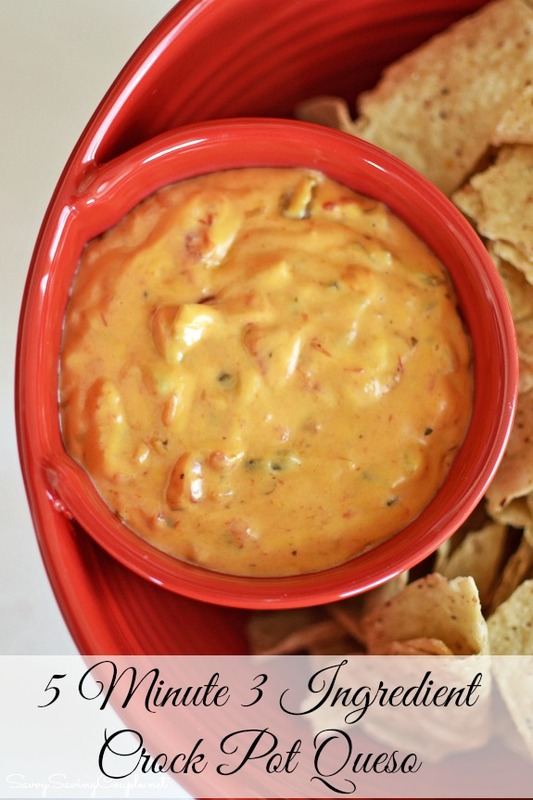 I am a huge fan of queso dip…. and all things crockpot! I’d buy the Women’s Sets of 2 Flannel Lounge Pants and Men’s Set of 2 Microfleece Shirts. I like the NFL Leopard Print Knee-Highs and the 10 pc. glass bowl set. I would get the nfl duffle bag and socks for the green bay packers. They have some neat things. I would get the 60-Pc. Wooden Magnetic Dress-Up Set. FIVE MINUTES!?! That’s much too long to wait for something this tasty looking. I’d get the NFL Woven Baby Throw with Packers on it! How adorable is that! I would like the Personalized NFL Locker Room Print 49ers. I like the Plush Turtle Ball Pit. The Woodland Booty Toilet Paper Holder would be a perfect gift for a friend of mine LOL! I would get the Pour-Spout Bakeware with Rack. I’ll get some Easy-to-Grow Bulbs for my garden. My kiddos would really love the Rainbow Parachute with plastic balls! I would get the Steelers wine glass and stopper set for myself and the Steelers gnome for the yard. I would get the Colorful 8-piece Cookware Set! I like the Big Pine Lodge quilt. I would buy the Inspirational Angel Crosses..they are beautiful! I just love the Kids with Solar Fireflies outdoor statue. It is just precious. I would like to get the 3-Pc. St. James Quilt Sets. The 65″ Slim Storage Cabinet is really practical, space saving is a big issue in my kitchen. I would get the Bronze Kitchen Collection! I would buy the 65″ Slim Storage Cabinet. I would like to have the Sets of 4 Disney Juice Glasses- Toy Story. I would purchase a MLB Grill Cover for my husband. I would get the NFL Gameday Sculpted Bowls with Browns on it. Id take anything off this site, I love LTD. I would love a new football blanket with Colts on it. the Side Storage Table with Bin. Thanks! I would get the collegiate throw – Penn State.